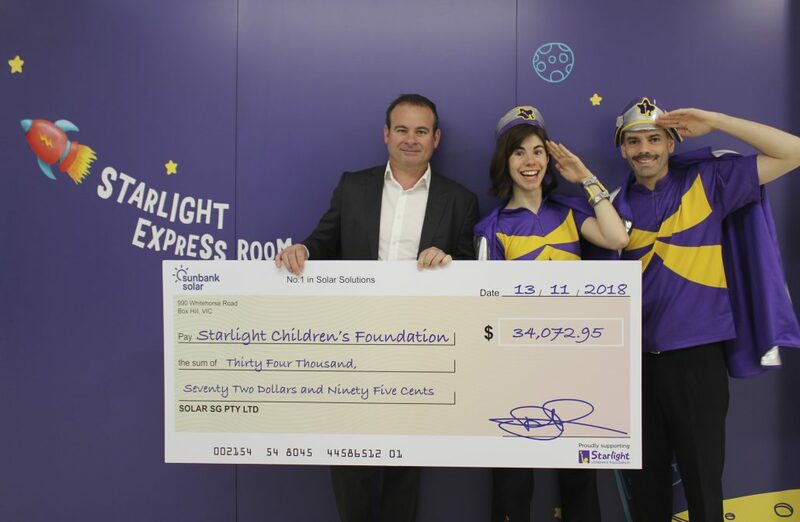 Sunbank Solar have a vision to do more with your solar, so we have partnered with the Starlight Children’s Foundation to take this vision to new heights. With a goal of raising funds to power the happiness of seriously ill children and their families. With this commitment, we are powering joy and laughter to sick Aussie kids in Starlight Express Rooms around the country. These bright medical-free havens are filled with fun, music, craft and games – a place where kids can forget about being sick and get down to the serious business of having fun! So, while doctors treat a child’s illness, Captain Starlight provides an essential dose of laughter, play and creativity. 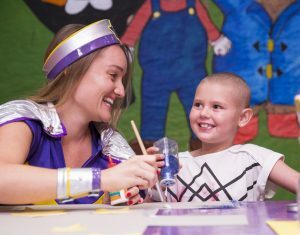 For sick kids, Captain Starlight makes hospital fun and gives families a much needed break. Stay tuned and watch our battery charge as we get closer and closer to reaching this tremendous goal. Seven-year-old Jasmine can be a little shy at first, but once she opens up she’s a lot of fun – she loves dancing, arts and crafts, and is a keen animal lover. She also loves to get outside and play sport whenever she can, and is full of energy. That’s why her mum, Vanessa, knew something wasn’t right when she had a cold that lingered much longer than normal. Jasmine was pale and lethargic, not herself at all. Vanessa took Jasmine to the doctor, who recommended some blood tests – just in case. It’s what any parent would do, never suspecting anything would be seriously wrong. It was the day before Mother’s Day when Jasmine had the blood tests. Mother’s Day will never be the same again for this family. At the beginning, Jasmine didn’t understand what was going to happen. When they arrived at the hospital, she saw some other children who had lost their hair as a result of their chemotherapy. Vanessa remembers her saying, “Oh, Mum, they’re so much sicker than me. At least I’m not going to lose my hair or anything.” It broke Vanessa’s heart to have to explain that the treatment she would be going through would, in fact, make her lose her hair, and much more. Jasmine loves playing in the Starlight Express Room with the friends she’s made there. She’s spent hours and hours playing princesses with the Captain Starlights, laughing and being silly just the way she should. Because in the Starlight Express Room, she isn’t “Jasmine who has cancer”, she’s “Princess Jasmine”! She isn’t defined by her illness – she’s just a normal kid having fun, and she can forget all about doctors and tests and being in hospital. We’ve been through a really horrible, tough time, but Starlight made everything a lot easier. The Captains are able to make the children feel normal again, but also very special. We’ll always be grateful. The Starlight Express Room also played an important role in making Jasmine’s treatment more manageable and improving her overall hospital experience. It was a wonderful distraction that meant she was able to tolerate the stress and pain of her chemotherapy. In fact, it’s still a bargaining chip that Vanessa can use when Jasmine needs to go back to Sydney for tests and check-ups, even though, thankfully, she is now in remission. 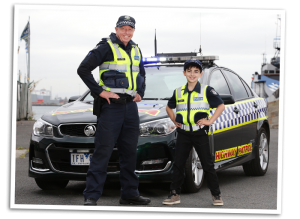 Don’t be surprised if one day you have to address 10-year-old Syel as “Sergeant!” Inspired by his hero Sergeant Mick McCrann from the Channel 7 TV show Highway Patrol, Sy’s dream is to be a policeman when he grows up. Before Sy was born, an ultrasound revealed he had a brain cyst and at just three months old, Sy had an operation to insert a shunt to drain the cerebral spinal fluid from his brain. 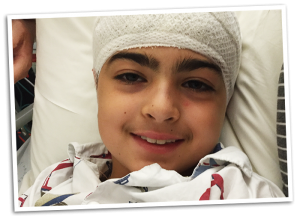 He endured two further brain surgeries as a young boy. His mum Lisa said: “Sy was later diagnosed with autism and has learning difficulties. But he’s the first to help out others and has such a strong sense of empathy.” Two years ago, life changed immeasurably for this happy, caring little boy when he suffered a major seizure. He was rushed to hospital where he was diagnosed with Complex Epilepsy. The shock was unimaginable for the close‑knit family. Sy’s life of bike riding, soccer and laughing with his friends was replaced by fear, uncertainty and long stays in hospital. The biggest impact on family life were the long, exhausting days in hospital. Lisa or Feras (Sy’s Dad) always stayed overnight in hospital which was hard on Sy’s older sisters Grace and Adelaide. That’s why the Starlight Express Room is so important. When Sy’s in hospital, the Starlight Express Room is a place where he can be a kid again without worrying about his illness. And his sisters and grandmas can visit too! Lisa said Starlight has been a vital part of Sy’s recovery – physically, emotionally and psychologically. Thanks to our supporters, another ray of sunshine has brightened Sy’s life. He was granted his Starlight Wish, which was our 10,000th Starlight Wish! Sy’s wish was to be a policeman alongside his hero Sergeant Mick McCrann. Sy’s wish was an unforgettable week-long adventure. After training with the AFP, Sy met his hero Sergeant Mick McCrann and learnt all about what it’s like to be a police officer. Sy was officially welcomed into the Victoria Police Force as ‘Sergeant Sy.’ The force’s newest recruit was ready to tackle crime and had his dad in his sights! In a highlight of the week, ‘Sergeant Sy’ pulled his dad over and charged him with the very serious crime of not buying him an ice cream! Sy’s Starlight Wish was a life-long dream come true and gave his family so many happy memories to treasure forever. Sunbank Solar & Starlight’s battery is charging, with a mission to fully charge, over and over again. Help us charge this battery for seriously ill children across Australia – today!